On August 11, 1965, an African-American motorist was arrested for drunk driving. A minor roadside argument broke out, and then escalated into a fight. The community reacted in outrage to allegations of police brutality that soon spread, and six days of looting and arson followed. Los Angeles police needed the support of nearly 4,000 members of the California Army National Guard to quell the riots, which resulted in 34 deaths and over $40 million in property damage. The riots were blamed principally on police racism. It was the city's worst unrest until the Rodney King riots of 1992. In the Great Migration of the 1920s, major populations of African-Americans moved to Northern and Midwestern cities such as Detroit, Chicago, St. Louis, Cincinnati, Philadelphia, Boston, and New York City to pursue jobs in newly established manufacturing industries; to establish better educational and social opportunities; and to flee racial segregation, Jim Crow Laws, violence and racial bigotry in the Southern states. This wave of migration largely bypassed Los Angeles. In the 1940s, in the Second Great Migration, black Americans migrated to the West Coast in large numbers, in response to defense industry recruitment efforts at the start of World War II. The black population in Los Angeles leapt from approximately 63,700 in 1940 to about 350,000 in 1965, rising from 4% of LA's population to 14%. Los Angeles had racial restrictive covenants that prevented blacks and Mexican Americans from renting and buying in certain areas, even long after the courts ruled them illegal in 1948. Since the beginning of the 20th century, Los Angeles has been geographically divided by ethnicity. In the 1910s, the city was already 80% covered by racially restrictive covenants in real estate. By the 1940s, 95% of Los Angeles and southern California housing was off-limits to African Americans and Asians. Minorities who had served in World War II or worked in L.A.'s defense industries returned to face increasing patterns of discrimination in housing. In addition, they found themselves excluded from the suburbs and restricted to housing in East or South Los Angeles, which includes the Watts neighborhood and Compton. Such real-estate practices severely restricted educational and economic opportunities available to the minority community. For a time in the early 1950s, with its increasing numbers of African Americans, South Los Angeles became the site of significant racial violence. In the area south of Slauson Avenue, whites bombed or fired into houses and set crosses burning on the lawns of homes purchased by black families. In an escalation of behavior that began in the 1920s, white gangs in nearby cities such as South Gate and Huntington Park routinely accosted blacks who traveled through white areas. Suburbs in the Los Angeles area grew explosively. Most of these suburbs barred black people using a variety of methods. This provided an opportunity for white people in neighborhoods bordering black districts to leave en masse to the suburbs. The spread of African Americans throughout urban Los Angeles was achieved in large part through blockbusting, a technique whereby real estate speculators would buy a home on an all-white street, sell or rent it to a black family, and then buy up the remaining homes from Caucasians at cut-rate prices, then sell them to housing-hungry black families at hefty profits. Los Angeles' African American residents were excluded from the high-paying jobs, affordable housing, and politics available to white residents; moreover, they faced discrimination by the Los Angeles Police Department (LAPD). In 1950, William H. Parker was appointed and sworn in as Los Angeles Chief of Police. After a major scandal called Bloody Christmas of 1951, Parker pushed for more independence from political pressures that would enable him to create a more professionalized police force. The public supported him and voted for charter changes that isolated the police department from the rest of the city government. In the 1960s, the LAPD was promoted as one of the best police forces in the world. Despite its reform and having a professionalized, military-like police force, William Parker's LAPD faced heavy criticism from the city's Latino and black residents for police brutality. Chief Parker coined the term "Thin Blue Line." These racial injustices are cited as reasons why Watts' African-American population exploded on August 11, 1965 in what would become the Watts Riots. When Rena Price reached the intersection of Avalon Boulevard and 116th Street that evening, she scolded Frye about drinking and driving, as he recalled in a 1985 interview with the Orlando Sentinel. The situation quickly escalated: Someone shoved Price, Frye was struck, Price jumped an officer, and another officer pulled out a shotgun. Backup police officers attempted to arrest Frye by using physical force to subdue him. After rumors spread that the police had roughed up Frye and kicked a pregnant woman, angry mobs formed. As the situation intensified, growing crowds of local residents watching the exchange began yelling and throwing objects at the police officers. Frye's mother and brother fought with the officers and were eventually arrested along with Marquette Frye. After the arrests of Price and the Frye brothers, the crowd continued to grow along Avalon Blvd. Police came to the scene to break up the crowd several times that night, but were attacked with rocks and concrete. A 119-square-kilometer (46-square-mile) swath of Los Angeles would be transformed into a combat zone during the ensuing six days. Police arrest a man during the riots on August 12. After a night of increasing unrest, police and local black community leaders held a community meeting on Thursday, August 12, to discuss an action plan and to urge calm. The meeting failed. Later that day, Los Angeles police chief William H. Parker called for the assistance of the California Army National Guard. Chief Parker believed the riots resembled an insurgency, compared it to fighting the Viet Cong, and decreed a "paramilitary" response to the disorder. Governor Pat Brown declared that law enforcement was confronting "guerillas fighting with gangsters". The rioting intensified, and on Friday, August 13, about 2,300 National Guardsmen joined the police in trying to maintain order on the streets. Sergeant Ben Dunn said: "The streets of Watts resembled an all-out war zone in some far-off foreign country, it bore no resemblance to the United States of America." By nightfall on Saturday, 16,000 law enforcement personnel had been mobilized and patrolled the city. Blockades were established, and warning signs were posted throughout the riot zones threatening the use of deadly force (one sign warned residents to "Turn left or get shot"). 31 people of the 34 people killed during the riots died from law enforcement bullets. Angered over the police response, residents of Watts engaged in a full-scale battle against the law enforcement personnel. Rioters tore up sidewalks and bricks to hurl at Guardsmen and police, and to smash their vehicles. To quell the riots, Chief Parker initiated a policy of mass arrest. 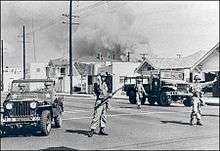 Following the deployment of National Guardsmen, a curfew was declared for a vast region of South Central Los Angeles. In addition to the Guardsmen, 934 Los Angeles Police officers and 718 officers from the Los Angeles County Sheriff's Department were deployed during the rioting. Watts and all black majority areas in Los Angeles were affected by the curfew. All residents outside of their homes in the affected areas after 8:00pm were subject to arrest. Eventually nearly 4,000 people were arrested, primarily for curfew violations. By the morning of Sunday, August 15, the riots had largely been quelled. Between 31,000 and 35,000 adults participated in the riots over the course of six days, while about 70,000 people were "sympathetic, but not active." Over the six days, there were 34 deaths, 1,032 injuries, 3,438 arrests, and over $40 million in property damage. White Americans were fearful of the breakdown of social order in Watts, especially since white motorists were being pulled over by rioters in nearby areas and assaulted. Many in the black community, however, saw the rioters as taking part in an "uprising against an oppressive system." In a 1966 essay, black civil rights activist Bayard Rustin stated: "The whole point of the outbreak in Watts was that it marked the first major rebellion of Negroes against their own masochism and was carried on with the express purpose of asserting that they would no longer quietly submit to the deprivation of slum life." Despite allegations that "criminal elements" were responsible for the riots, the vast majority of those arrested had no prior criminal record. Los Angeles police chief Parker publicly stated that the people he saw rioting were acting like "monkeys in the zoo." Overall, an estimated $40 million in damage was caused, with almost 1,000 buildings damaged or destroyed. Homes were not attacked, although some caught fire due to proximity to other fires. Debates quickly surfaced over what really happened in Watts, as the area was known to be under a great deal of racial and social tension. Reactions and reasoning about the riots greatly varied based on the perspectives of those affected by and participating in the riots' chaos. Martin Luther King Jr. spoke two days after the riots happened in Watts. The riots were partly a response to Proposition 14, a constitutional amendment sponsored by the California Real Estate Association that had in effect repealed the Rumford Fair Housing Act. In 1966, the California Supreme Court reinstated the Rumford Fair Housing Act in the Reitman v. Mulkey case (a decision affirmed by the U.S. Supreme Court the following year). Many opinions and explanations appeared as other sources attempted to explain the causes. Public opinion polls have shown that an equal percentage of people believed that the riots were linked to communist groups versus those that blamed social problems like unemployment and prejudice. Those opinions concerning racism and discrimination emerged only three years after hearings conducted by a committee of the U.S. Commission on Civil Rights took place in Los Angeles to assess the condition of relations between the police force and minorities. These hearings were also intended to make a ruling on the discrimination case against the police for their alleged mistreatment of members of the Nation of Islam. These different arguments and opinions still prompt debates over the underlying causes of the Watts riots. A commission under Governor Pat Brown investigated the riots, known as the McCone Commission, and headed by former CIA director John A. McCone. It released a 101-page report on December 2, 1965 entitled Violence in the City—An End or a Beginning? : A Report by the Governor's Commission on the Los Angeles Riots, 1965. Marquette Frye, who smoked and drank heavily, died of pneumonia on December 20, 1986 at age 42. His mother, Rena Price, died on June 10, 2013, at 97. She never recovered the impounded 1955 Buick in which her son had been pulled over for driving while intoxicated on August 11, 1965, because the storage fees exceeded the car's value. The 1972 music festival at Los Angeles Coliseum known as Wattstax, and its follow-up 1973 documentary film, were created to commemorate the seventh anniversary of the riots. Phil Ochs' 1965 song "In the Heat of the Summer", most famously recorded by Judy Collins, was a chronicle of the Watts Riots. Curt Gentry's 1968 novel, The Last Days of the Late, Great State of California, dissected the riots in detail in a fact-based semi-documentary tone. Scenes in "Burn, Baby, Burn", an episode of the TV series Dark Skies, takes place in Los Angeles during the riots. In Chapter 9 of "A Song Flung Up To Heaven", the sixth volume of Maya Angelou's autobiography, Angelou gives an account of the riots. She had a job in the neighborhood at the time and experienced the riots first-hand. The arrest of the Fryes and the ensuing riots are referenced by the character George Hutchence in the second volume of the comics miniseries Jupiter's Circle, as an example of the class struggle that he felt he had been perpetuating as a superhero, and which prompted him to give up that life. ↑ "Watts Riots (Los Angeles, 1965)". King Encyclopedia. Stanford University. Retrieved November 23, 2011. 1 2 3 4 5 6 7 Hinton, Elizabeth (2016). From the War on Poverty to the War on Crime: The Making of Mass Incarceration in America. Harvard University Press. pp. 68–72. ↑ Taylor, Dorceta (2014). Toxic Communities: Environmental Racism, Industrial Pollution, and Residential Mobility. NYU Press. p. 202. ISBN 9781479861620. 1 2 3 Bernstein, Shana (2010). Bridges of Reform: Interracial Civil Rights Activism in Twentieth-Century Los Angeles. Oxford University Press. pp. 107–109. ISBN 9780199715893. ↑ Michael Dear; H. Eric Schockman & Greg Hise (1996). Rethinking Los Angeles. SAGE. p. 40. ISBN 9780803972872. ↑ Theoharis, Jeanne (2006). The Black Power Movement: Rethinking the Civil Rights-Black Power Era. (New York: Routledge), p. 47-49. Archived at Google Books. Retrieved February 4, 2016. ↑ Shaw, David (May 25, 2014). "Chief Parker Molded LAPD Image--Then Came the '60s : Police: Press treated officers as heroes until social upheaval prompted skepticism and confrontation.". Los Angeles Times. Retrieved 21 September 2014. ↑ Watts Riots (August 1965) | The Black Past: Remembered and Reclaimed. The Black Past (August 11, 1965). ↑ Dawsey, Darrell (August 19, 1990). "To CHP Officer Who Sparked Riots, It Was Just Another Arrest". Los Angeles Times. ↑ Cohen, Jerry; Murphy, William S. (July 15, 1966). "Burn, Baby, Burn!" Life. Archived at Google Books. Retrieved February 4, 2016. ↑ Szymanski, Michael (August 5, 1990). "How Legacy of the Watts Riot Consumed, Ruined Man's Life". Orlando Sentinel. Retrieved 22 June 2013. ↑ Dawsey, Darrell (August 19, 1990). "To CHP Officer Who Sparked Riots, It Was Just Another Arrest". Los Angeles Times. Retrieved November 23, 2011. ↑ Woo, Elaine (June 22, 2013). "Rena Price dies at 97; her and son's arrests sparked Watts riots". Los Angeles Times. Retrieved 22 June 2013. ↑ Walker, Yvette (2008). Encyclopedia of African American History, 1896 to the Present: From the Age of Segregation to the Twenty-first Century. Oxford University Press. ↑ Alonso, Alex A. (1998). Rebuilding Los Angeles: A Lesson of Community Reconstruction (PDF). Los Angeles: University of Southern California. 1 2 3 Barnhill, John H. (2011). 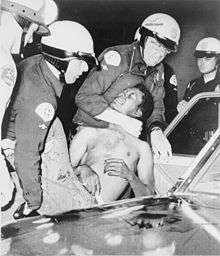 "Watts Riots (1965)". In Danver, Steven L. Revolts, Protests, Demonstrations, and Rebellions in American History, Volume 3. ABC-CLIO. 1 2 "Violence in the City: An End or a Beginning?". Retrieved January 3, 2012. 1 2 3 Oberschall, Anthony (1968). "The Los Angeles Riot of August 1965". Social Problems. 15 (3): 322–341. doi:10.2307/799788. JSTOR 799788. ↑ "A Report Concerning the California National Guard's Part in Suppressing the Los Angeles Riot, August 1965" (PDF). 1 2 3 4 "The Watts Riots of 1965, in a Los Angeles newspaper... ". Timothy Hughes: Rare & Early Newspapers. Retrieved February 4, 2016. ↑ Reitman, Valerie; Landsberg, Mitchell (August 11, 2005). "Watts Riots, 40 Years Later". Los Angeles Times. ↑ "Watts Riot begins - August 11, 1965". This Day in History. History. Retrieved February 3, 2016. ↑ "Finding aid for the Watts Riots records 0084". Online Archive of California. Retrieved February 3, 2016. ↑ Queally, James (July 29, 2015). "Watts Riots: Traffic stop was the spark that ignited days of destruction in L.A.". Los Angeles Times. ↑ Rustin, Bayard (March 1966). "The Watts". Commentary Magazine. Retrieved January 3, 2012. 1 2 Jeffries,Vincent & Ransford, H. Edward. "Interracial Social Contact and Middle-Class White Reaction to the Watts Riot". Social Problems 16.3 (1969): 312–324. ↑ Dawsey, Darrell (July 8, 1990). "25 Years After the Watts Riots : McCone Commission's Recommendations Have Gone Unheeded". Los Angeles Times. Retrieved November 22, 2011. ↑ "Marquette Frye Dead;'Man Who Began Riot". New York Times. December 25, 1986. Retrieved 23 June 2013. ↑ "Rena Price, woman whose arrest sparked Watts riots, dies at 97". ↑ Abramovich, Alex (July 20, 2001). "The Apes of Wrath – By Alex Abramovich – Slate Magazine". Slate.com. Retrieved 2011-08-30.